Each individual presents a unique set of observable characteristics. Where do these traits come from? 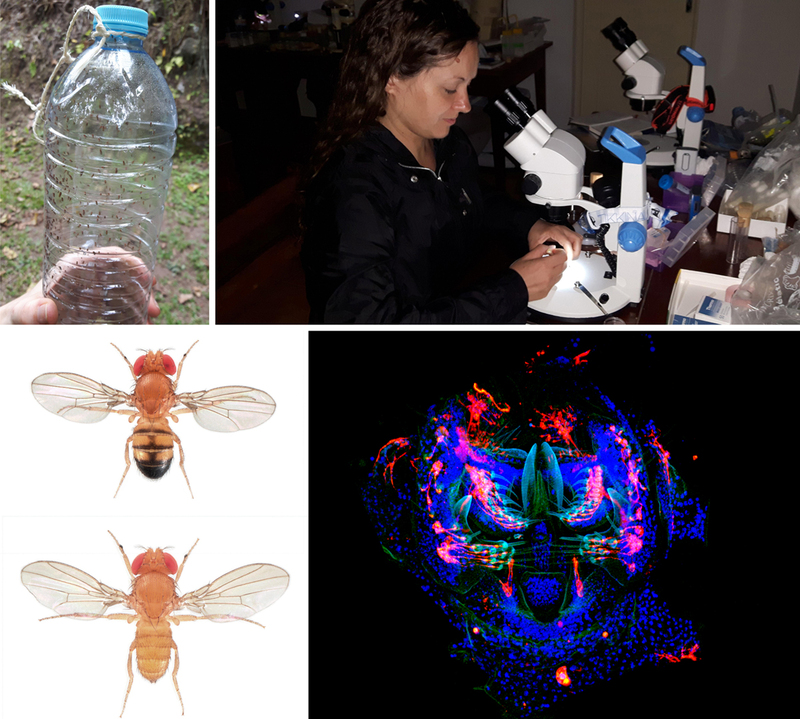 Through her work on fruit flies, Dr Virginie Courtier-Orgogozo aims to decipher the connections between genes and observable features of living creatures, in order to better understand our evolution. Our attributes result from complicated biological mechanisms translating our genes into something we can actually see. Genes can determine differences – whether we have brown or blond hair, whether we are tall or short – and our similarities. Each species is characterised by a series of visible traits. For example, compared to our closest living species, the chimpanzee, we humans have no tail, shorter hairs on most of the body, soft nails and a sophisticated language. To understand what makes us what we are, as human beings or as individuals, it is important to explore the origin of our traits. Dr Courtier-Orgogozo and her team, from CNRS and the Institut Jacques Monod in Paris, employ a cutting-edge multi-tool genetics approach, financed by an ERC Starting Grant, to explore the genetic causes of species-specific traits. They examine visible changes between closely related species of fruit flies and aim to reconstruct their evolutionary history and the origin of their differences. For example, between humans and chimpanzees, there is about a 1-5% difference in DNA. Among all these mutations, which ones are responsible for our human characteristics? Fruit flies are perfect organisms for genetic research because closely-related species can produce hybrids, a process in which pieces of DNA from one species are introduced in the genome of another species, thus allowing researchers to explore the consequences of genetic mix and the effect of particular genomic regions. Dr Courtier-Orgogozo’s team recently analyzed a species of fruit fly which lives on the volcanic Island Sao Tomé. This species is devoid of two particular sensory organs that are present in all related species. The insular species contains more than one million mutations in its DNA compared to its sister species. Among all these sequence changes, the team searched for the one responsible for the loss of sensory organs. Their discoveries uncovered two unexpected results. First, they found not just one mutation but three different ones. Introducing one mutation at a time has a small effect, and introducing the three together has a much stronger effect. Thus, one mutation is not enough to obtain flies with no organ, and each mutation has been important during evolution. Second, they found that the three mutations are located within a tiny portion of the genome. In contrast, the millions of mutations that occurred during the evolution of the insular species are scattered all over the genome. It is like looking for three cell phones lost anywhere along the road between New-York and Boston (300km) and finding them all within one meter. The team is now investigating why all three mutations happened in such a limited region of the genome. Their work suggests that the roads for evolution are not as numerous as previously thought. For certain visible changes to occur, nature does not have multiple options. In fruit flies, there is a gene whose manipulation can lead to additional sensory organs when it is expressed at higher levels, and fewer sensory organs when expressed at lower levels. The three mutations were found to decrease the expression of this gene, thus leading to fewer organs. To change sensory organ number, evolution seems to prefer to manipulate this gene. Another ongoing project examines the mechanisms that stabilise biological systems. Traits characteristic of human beings or of any other species are fairly stable between individuals yet such traits have changed between species during evolution. The goal is to explain the mechanisms and genes that act together to produce robust characteristics. Experiments are under­taken to test whether the mutations that occur during evolution first produce new traits that are unstable and that get stabilised secondarily because of subsequent mutations or whether mutations directly create new robust outcomes. The third line of research is the compilation of data from scientific literature about the genes and the mutations identified to be responsible for natural variation between populations or species in animals and plants. The dataset is accessible at www.gephebase.org. It shows that evolution often repeats itself and does not take as many paths as we might have thought. For example, adaptation to high altitude evolved independently in humans and birds through modification of the same genes. This result is reminiscent of the team’s results on the evolution of sensory organs in fruit flies. It seems like there is a dictionary of correspondence between traits and genes, and Dr Courtier-Orgogozo aims to decipher this dictionary. The current state of knowledge of the connections between genes and traits is so advanced that, in some cases, researchers can now successfully predict which genes should be modified to achieve a specific visible modification. The new CRISPR-Cas9 genetic engineering technology allows resear­chers to put this knowledge into practice, and to rapidly modify domestic animals as they wish. The laboratory is sensitive to the potential ethical problems posed by CRISPR-Cas-9 and tries to bring his expertise to societal issues related to CRISPR-Cas9. Dr Courtier-Orgogozo’s research tackles several central questions in evolutionary genetics and provides new, rigorous data to better understand our evolution, past and future. What is the connection between genes and visible traits?